U.S. Route 66, also known as the Mother Road, is propably the most iconic road in the world. The first time I heard about Route 66 was many years ago when I listened the Rolling Stones playing "Get your kicks on Route 66". From that moment on I loved the 66 and especially all the buildings, the art deco' gas stations and the advertising signs along the road. 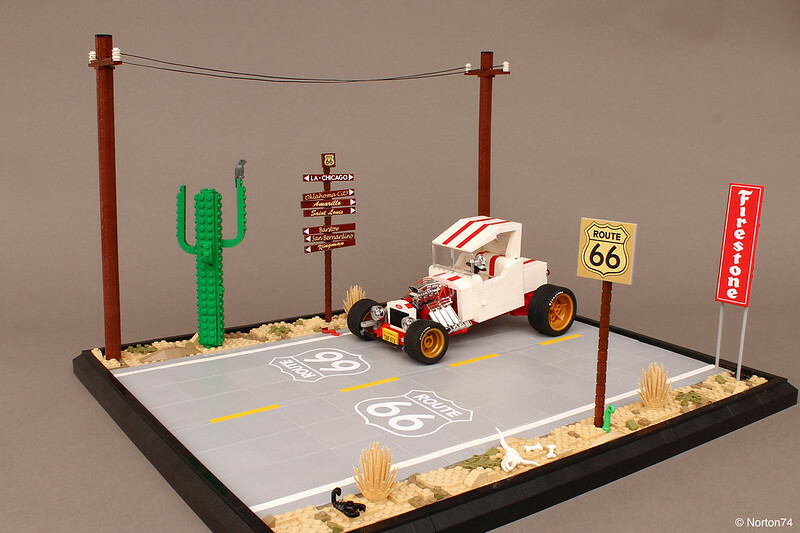 I built a little piece of the Route to present my latest Hot Rod that has a great story at its back too. 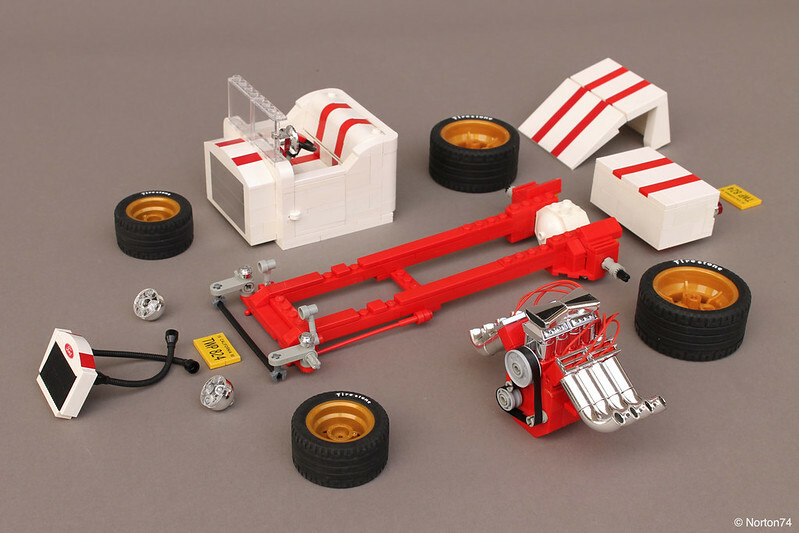 The red/white machine in the pic was owned and raced by Hayward V-Eights member Lee A. Jagla of Hayward, California. Lee got the hot rod as a gift from his parents for his high school graduation in 1960. In 1965 the “T” went into storage, and spent the next 48 years locked up in a dry garage. When Lee passed away, his daughter sold the old hot rod as part of her dad's estate. In 2014 it was advertised for sale on eBay. Jon Aksel Lier of Tønsberg, Norway, found the listing and won it. 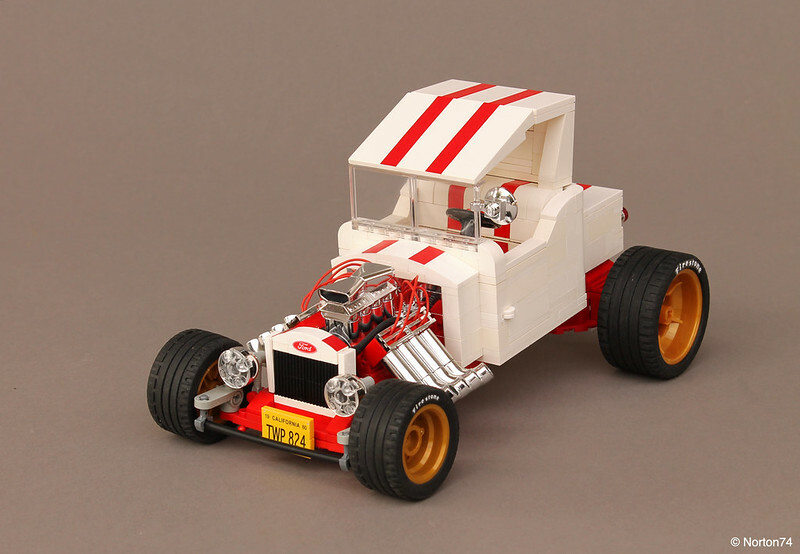 The car features a '23 Ford Model T body mounted on a '30 Ford Model A frame. Power comes from a 241 cu. in. '53 Dodge baby Hemi that ran an Offenhauser intake manifold and a single 4 barrel carburetor. It ran 1939 Ford taillights and Yankee brand headlights. Painted white with a red chassis. Plus I added two red stripes on the entire machine, a little hard-top and the brand Ford in red on the back of the turtle deck. More info and pics on flickr. Thanks for stopping by. I have been to Chicago where 66 starts and it goes through St Louis where I live now...this is more the desert part of it, iconic and you captured it. Great build and thanks for sharing. Very clean and smooth model as usual. Nice! The engine piece is cool and the sign looks well made. As someone who's driven the western half of Route 66 (well, what's left of it), I have to say you did a fantastic job. The engine in particular is really well designed. Thanks, glad you appreciate details! Again you blow me away!!! It's an impressive creatio.I mixed the name with road 60 but I don;t regret it!!! Did you see the movie? And where is your driver? Even my Hot Rods need a tune up from time to time...and this time the little Ford Roadster seems having some troubles on the front axle. Hosted at the Esso garage it will be back fit soon. Whoah! This is great. The Michelin man really got me. I love it. I like the desert highway with the saguaro cactus. That's some of the most beautiful scenery in North America. 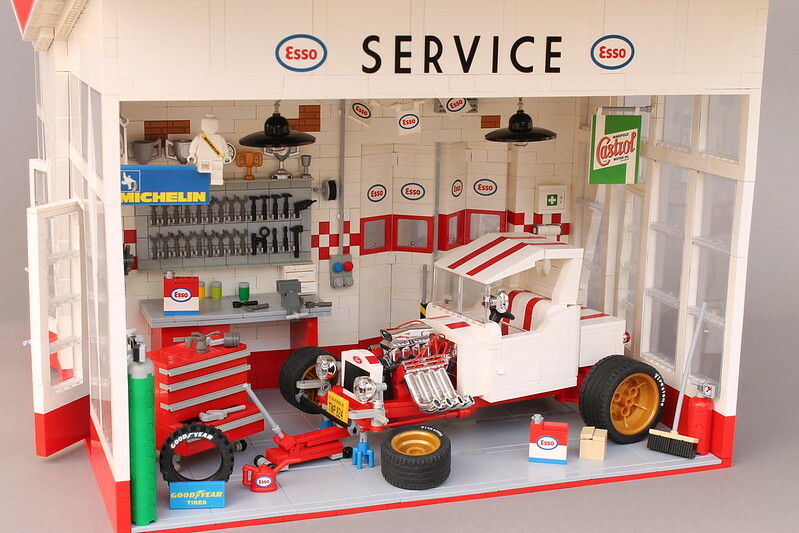 The Garage also has a real retro feel to it, and all the detail make it stand out as a very unique build. I really like all the signage. The car is the best part of course. I get to work on cars like this all the time, and I even have some, so whenever someone builds rods or kustoms, I can really appreciate the detail having gone into it. Very Nice! Many thanks for your kind words and I'm very glad you appreciate my MOC and all the details. I wish you a merry Christmas and a full of bricks new year!